This news is a bit old (from 2014), but I thought I should post it because I would like this site to log some of my major accomplishments. In July 2014 I won the American Association of Physics Teachers’ high school physics photo contest. AAPT is an organization that collects and judges thousands of entries from hundreds of different schools across America and internationally. The photo I submitted won first place in the contrived category (as opposed to natural), and I am very proud of the work and effort I put into it. I’d like to thank Mr. Lapp, my high school physics teacher, for encouraging his students to take excellent photos and doing his best to connect with every student to teach them in the best way he can. I went through many iterations trying to take the best photo I could. I also didn’t have any way of triggering my flash to capture the droplet at an exact time, so each shoot I took at least 100 photos and picked out the few best timed and in focus shots. Here’s how I set my camera up. In my first round of photos I used a plain white background, and I didn’t know how my photos would turn out. The key to droplet photography is the external flash, which you can see placed to the right of the small tupperware container in the photo above. With the aid of a darkened room, this makes the only light exposed on the camera’s sensor be at the exact desired instant, in this case right after the droplet hits the water. Coupled with a steady tripod and macro lens (or in my case the much less expensive set of macro extension tubes for my ordinary lens), this is a recipe for taking up-close shots of the exact instant of a droplet hitting the surface of water. 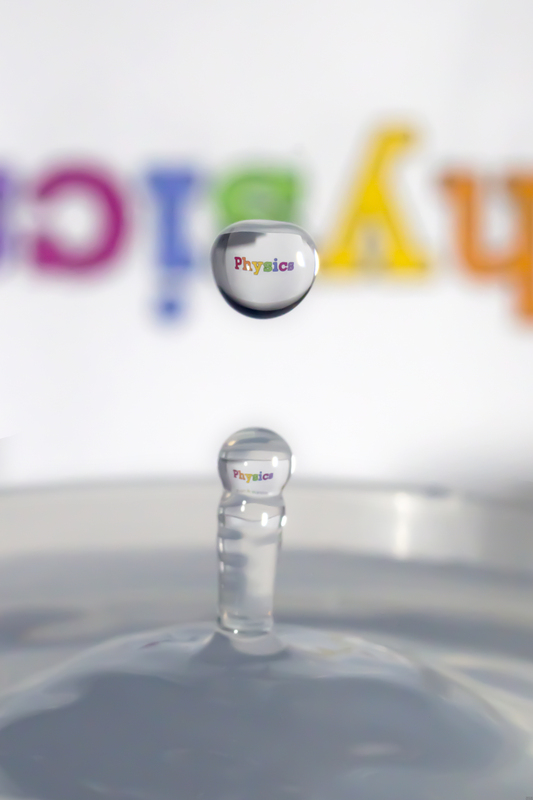 This turned out much better than I expected, and from that moment on I knew that I had a passion for droplet photography. Fast forward a little bit, and I was now thinking of interesting photo ideas relating to physics. I knew that water droplets diffracted light, so my first idea was to use a background and see how the droplet altered the image I saw. This was somewhat interesting, but now I was thinking of optics; I had seen droplets with a sort of “i” shape, with a column of water and a spherical droplet at the top. I knew spheres acted as converging lenses, and could display an inverted image of a real object. So I tested it by writing the word “physics” upside-down on a piece of paper and trying it out. Success! So after that I printed a more colorful “Physics” image, trying to evoke more ideas of light, refraction, and wavelengths of light by using rainbow. Plus, why not show a bit of pride? So that’s how I ended up with my final image: a lot of iterations, many out of focus and mis-timed photos, and finally a successful finished image. I hope you enjoyed reading about my physics photo, and just as a bonus for reading this far I’ll show you some more physics related photos I took in Mr. Lapp’s physics class. Some also appear in his self-written physics textbook.